President Barack Obama has dropped a water balloon onto No Child Left Behind. “In my State of the Union address this year I said Congress should reform No Child Left Behind law based on principles that have guided Race to the Top,” Obama said Friday morning at the White House. The President stamped his approval onto new education performance guidelines that the administration says were developed by governors and educators nationwide. 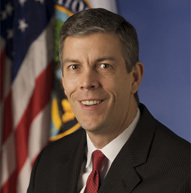 The White House released a two-page single spaced description of new guidelines that were developed by Education Secretary Arne Duncan with input from school system leaders nationwide. One feature is common core standards that 44 states including Georgia will use next year. Another feature would grant waivers from the NCLB mandate that 100% of students nationwide achieve reading/language arts and mathematics proficiency by 2014. Duncan has said 82% of schools nationally could fail to achieve NCLB goals next year, which means they would be labeled “failure schools” regardless of any other academic achievements. 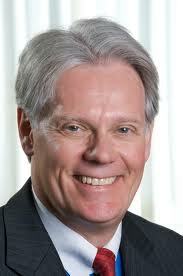 Many educators who include Georgia state Schools Superintendent John Barge agree the 2014 goals are unattainable. This week Barge and Georgia U.S. Sen. Johnny Isakson delivered the state’s NCLB waiver request to Duncan during a meeting in Washington D.C. Isakson and Barge also delivered the state’s proposal that would replace dreaded Annual Yearly Progress reports with a new model to measure performance over multiple years and also using other data. During opening remarks Obama noted that Duncan who lurked tall behind him is “probably the finest basketball player ever in the Capitol.” We will allow just a little wiggle room here for his long-time Chicago pal, although the President clearly overlooked former U.S. Sen. Bill Bradley whose 1983 election to the National Basketball Association Hall of Fame capped a stunning career. The lanky Bradley was NCAA Player of the Year at Princeton and a 1964 Olympian before he won two NBA championship rings during ten years with the New York Knicks. Bradley earned the NBA nickname “Dollar Bill” for his uncanny ability to hit big shots under pressure. The President can only hope Race to the Top is as successful as Bill Bradley playing basketball. Michelle Rhee, the innovative founder of StudentsFirst and former chancellor of Washington, D.C. public schools, spoke about the new Obama administration No Child Left Behind waivers when she appeared on CNN on Wednesday morning. “American Morning” host Christine Romans asked, has NCLB been a bust? “I don’t think so at all. Let me be clear that the law is not perfect. I think everyone knows there are some changes and modifications that need to be made, but I don’t think that anyone can doubt that it has brought a new level of accountability to American schools,” Rhee said. On Monday, U.S. Education Secretary Arne Duncan used the White House briefing room to announce that all 50 states could apply for waivers from the No Child Left Behind requirement that 100 percent of students be proficient in math and reading by 2014. Georgia will apply. 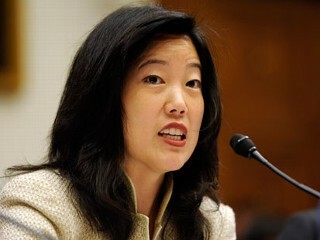 Michelle Rhee again on CNN: “We want kids to meet the standards. Now, is that all that should be happening? No. One of the things you see is tests only test certain subjects, often mat and reading, and sometimes what schools do is go overboard and they just try to jam reading and math down the kids’ throats. That’s not the answer. “The research shows that kids who have access to a broad-based curriculum are the ones who do better academically. But also, we shouldn’t go to the other direction to say testing is evil, testing is bad. We have to be able to, in a very objective and consistent way, know whether or not kids are learning and meeting the standards. The way to do that is a standardized test. “One of the things that drive people nuts about No Child Left Behind is that it sets certain benchmarks for proficiency. X percent of your kids have to be at proficiency and it goes up every year until 2014 when 100 percent of your kids are supposed to be proficient. People look at that and say, it’s not realistic. No Child Left Behind has moved one step closer toward No Longer Totally Relevant. President Barack Obama‘s administration used the White House briefing room on Monday afternoon to announce that states may apply for waivers to avoid 2014 testing mandates in NCLB. 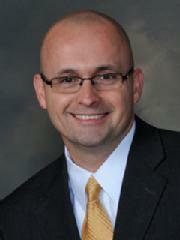 State school superintendent John Barge said Georgia will apply for the waiver. No Child Left Behind was the education initiative of President George W. Bush. It was modeled on a program enacted when he was Texas governor. It requires that 100 percent of public school students be proficient in math and reading by 2014. NCLB is blamed for creating a “Teach the Test” mania as schools struggled to make AYP – Adequate Yearly Progress. Addressing the White House press corps, Domestic Policy Director Melody Barnes described NCLB as “a punitive system that does not allow for reform.” Barnes said the administration moved forward with its own NCLB changes because Congress has not rewritten NCLB. Barnes and Duncan made clear that states will become eligible for NCLB waivers if they embrace reforms that the administration believes are necessary to move education forward. States that do not agree must continue to abide by the current No Child Left Behind legislation. Whereas NCLB was a top down federal mandate on states, Barge said the national Council of Chief State School Officers has been working on a replacement for NCLB’s single-minded reliance on standardized testing as the principal measuring stick for education success. “We all know that a student can pass a test but that student may be anything but prepared to be successful,” Barge said. The model being proposed to Washington by the state education chief executives will rely on some two dozen or more indicators, Barge said, including SAT and ACT scores, college credits earned during high school and other measurements to evaluate success. NCLB is sometimes identified as the reason for a surge in test cheating scandals. The Atlanta Public Schools test cheating scandal made national news when 178 educators were identified as participants in falsifying tests to improve school performance. Atlanta is not alone. Duncan has said federal officials will look into other possible cases nationwide. On Monday, he singled out Tennessee for taking the right approach to measuring achievement. “The state of Tennessee like many states had a low bar under No Child Left Behind,” Duncan said. “They were in fact lying to children, lying to parents. They were saying that 91 percent of students were proficient. They did the courageous thing. They raised the bar significantly. “Tennessee went from 91 percent of children proficient in math to 34 percent. That was a very tough lesson but for the first time, they are telling the truth. The current law provides lots of penalties for that kind of courage,” Duncan said. State schools superintendent John Barge believes chances are “slim” that Georgia will meet the federal government’s No Child Left Behind 100 percent proficiency requirement in three years. The first-year superintendent made that clear Thursday when the Department of Education released 2011 AYP – Adequate Yearly Progress – and graduation rate reports. Notably, the state did not release 2011 AYP results for the Atlanta Public Schools system which is embroiled in a test cheating scandal. The DOE website said results are being withheld until it “can determine which data are impacted by the investigation findings.” Some 179 educators were identified as possible test cheaters after a ten-month special prosecutors’ investigation. AYP is the national education measuring stick created by No Child Left Behind. President George W. Bush signed controversial legislation into law nine years ago. It mandates that schools nationwide improve math, languages and graduation percentage rates in successive years for schools to be judged as having met Adequate Yearly Progress expectations. During the 2002-2003 academic year an elementary school could meet AYP if 60 percent of third graders passed reading and language arts standardized tests. Today the minimum is 80 percent, next year 86.7 percent, one year later 93.3 percent, then 100 percent in 2014. The formulas are similar for all elementary, middle and high school AYP standardized tests. This article was published by the Franklin Center for Government & Public Integrity. An independent investigation under the direction of a blue ribbon commission has cited 109 Atlanta Public School principals, assistant principals and others for alleged cheating on student standardized tests. Cheating evidence was cited in 58 of Atlanta’s 84 public schools. Will Supreme Court Decide Georgia Virtual School Funding? Georgia education headlines are too often made for wrong reasons. National test scores that disappoint, high schools that under perform and the Atlanta public schools cheating scandal do nothing to recommend Georgia as forward thinking and a place to create a business and raise a family. Embracing an aggressive plan to fast forward online education would seem like a no-brainer.